Free Photos With Santa at Hollywood Storage Center! Make your list and check it twice, then head on over to Hollywood Storage Center of Thousand Oaks! On December 8, 9, 15 and 16, from 10 am to 4 pm, Santa Claus will make a special appearance at our Newbury Park facility! Let our photographer take your family photo with Old Saint Nick and take home your free photo, plus enjoy complimentary cookies and apple juice! Consider bringing new, unwrapped toys for our toy drive and Play Conejo, the charitable arm of the Conejo Recreation and Park District, will distribute them to families in need this holiday season. Hollywood Storage Center is one of the only venues in town where furry and feathered family members are welcome to jump in on the photo with Santa – with or without their owners – so be sure to bring them along! 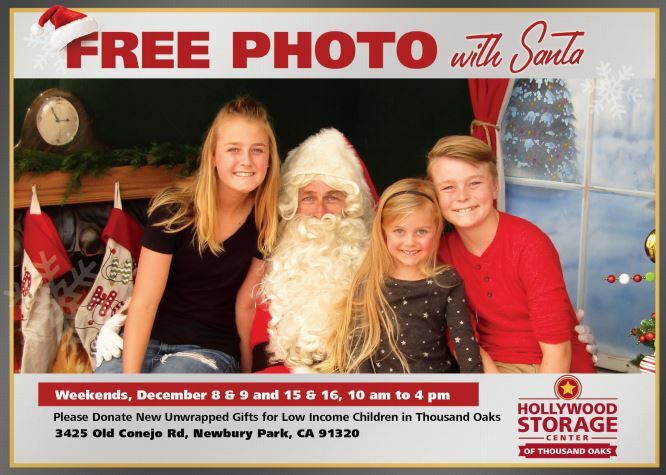 Every year, people from all over the Conejo Valley, including Agoura Hills, plus neighbors from Calabasas to Camarillo, join Thousand Oaks residents to kick off their holiday season at Hollywood Storage Center’s Free Photos with Santa and Toy Drive. If you want to help with the toy drive, our team will be gathering items for kids from ages 1 month to 17 years. All of the gifts will be given to children in the local community whose families struggle with daily living expenses, as their household incomes are far below the area median. If you’re ahead of the game and are prepared to ship off presents for friends and family, bring them along, and our post office team will take care of you. Or, pick up some festive stamps and finish up your holiday greeting cards! And of course, we’ll be open for business, so if you’re in need of a storage unit, to hide Santa’s loot, or for any other reason, we’re ready to assist. This entry was posted in Hollywood Storage Center, Newbury Park Storage, Things to do near Thousand Oaks and tagged christmas 2018, christmas photos, Free photos, holiday photos, Hollywood Storage Center, Photos with Santa, Santa, santa 2018, Santa Claus by Hollywood Storage Center. Bookmark the permalink.